Once in a while, I hear about a film that seems AMAZING and I immediately decide to save it, lock it down, keep it secret and safe until such time as I choose to give it its due AND avoid any spoilers if I can help it. Occasionally this backfires. Not every film can live up to such high expectations. 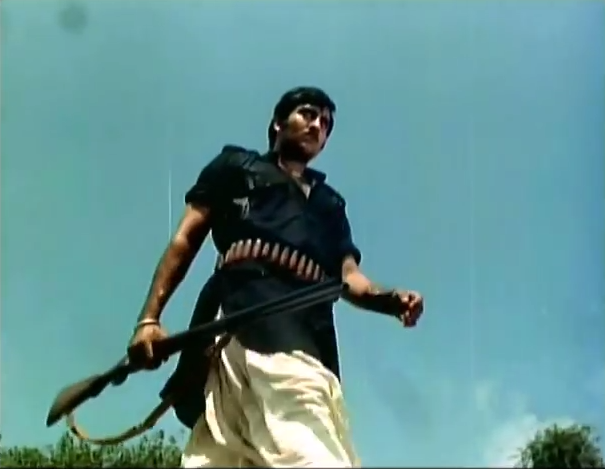 But Mera Gaon Mera Desh (1971) is worth the wait. I've been saving myself for this one for SO long (in Hindi film time anyway) that the abstinence campaign perhaps made the consummation sweeter. Pardon the horrible analogy. Seriously, though. In this case, I put it off because there's only so many top tier Indian westerns, and after seeing Kucche Dhaage and Sholay so early on, I needed to keep one for the road. 1. Cinematography. 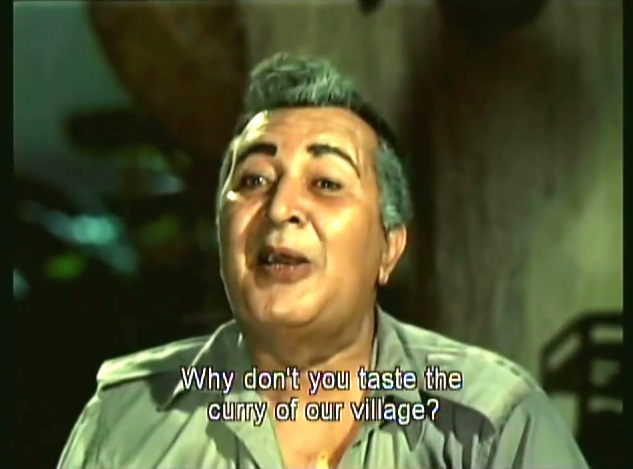 Raj Khosla, duh. 2. The location. 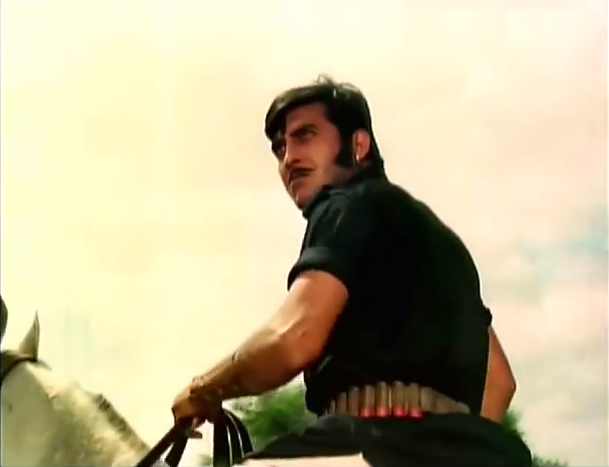 The village being attacked (by the perhaps most iconic Vinod Khanna dacoit of all) is satisfyingly anchored in space. The town looks and feels like a 3-D puzzle, the dimensions provide both suspenseful exposure and claustrophobia, the action flowing through the stacked houses and cobbled streets like rats through a maze. It reminds me the most of French-Italian films shot in the Algerian Casbah, like Pepe Le Moko or The Battle of Algiers. With action like this, who needs an original premise? 3. Time. There's lots of time devoted to well-crafted conversations, to deeper emotional realizations, or to suspense. This certainly speaks to the level of care behind the camera and in script development, but whoever edited the film knew what they were doing, too. 4. Music. I think there was actually a background score? Somebody can correct me if I'm wrong, and perhaps it was lifted from a lesser known spaghetti western, but it works. I love hearing tense guitar-strumming during emotional moments, rather than whining strings. 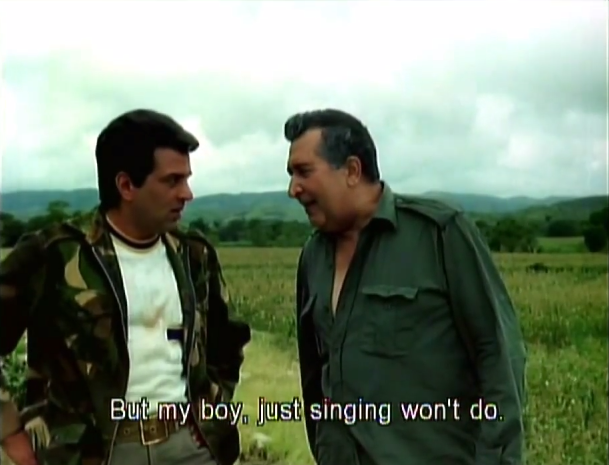 *Thankfully, Dharmendra inhabits this serious avatar's manly attire without adding a halo. 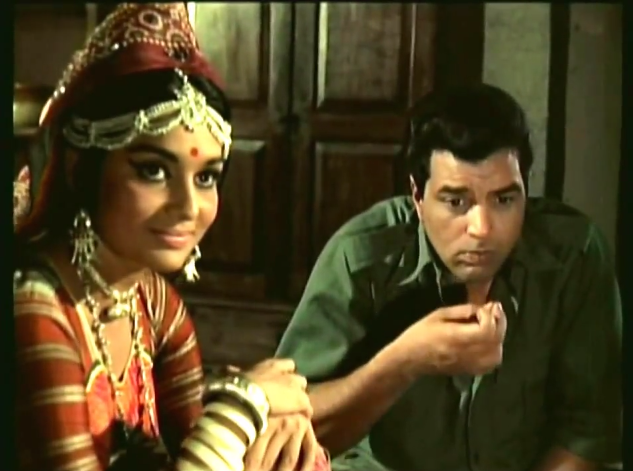 *Asha Parekh is fun and flirtatious and sometimes gets to join in the events to the point of MAKING A DIFFERENCE. *There's a poor 7 or 8 year old kid who runs around naked from the waist down in the first half of the film. I mention it, because I wonder if he ever lived the role down. 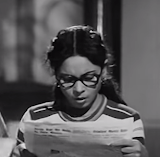 *Laxmi Chhaya makes you believe in her ill-fated character's choices, weighting potentially forgettable scenes with raw physicality and angry resignation. *Vinod is as good at being evil as I expected ... once again impressing me with his ability to use horsemanship as a dramatic accessory... especially as an instrument of intimidation. Caveat: The biggest downside to the film is the violent treatment of women. But, that's a blight on most contemporaries in the genre. I don't like it, but this film doesn't seem to like it either. Dharmendra's character first visits the house of his new employer/uncle/adopted baap. The rishta of it all is convoluted. The important thing is, D's character has a new lease on life and is being served food by his new village girl crush. 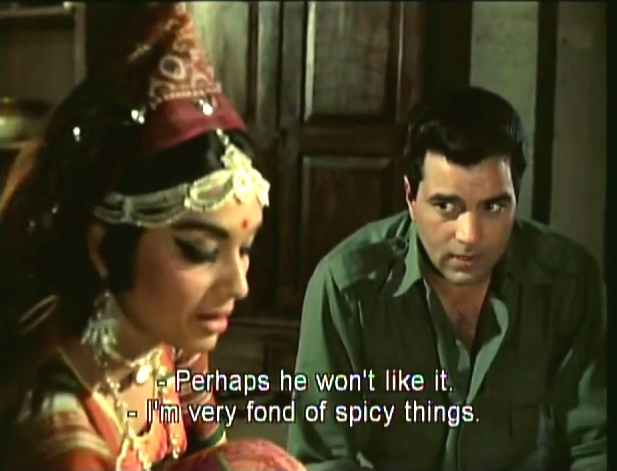 They start flirt-bickering via a discussion of whether or not Dharm can handle spicy food, but dear Work Uncle [naively] puts his foot in. Laughing at your final sentence. :) This was a good film; like you said, anchored by good performances and multi-dimensional characters. Yeah, it was good, and not just because I like Westerns. Definitely have a few people I'd like to show this one to. That one scene you mention stands out to me as well. The framing and the timing of it all was unusually suspenseful for a film of the period. 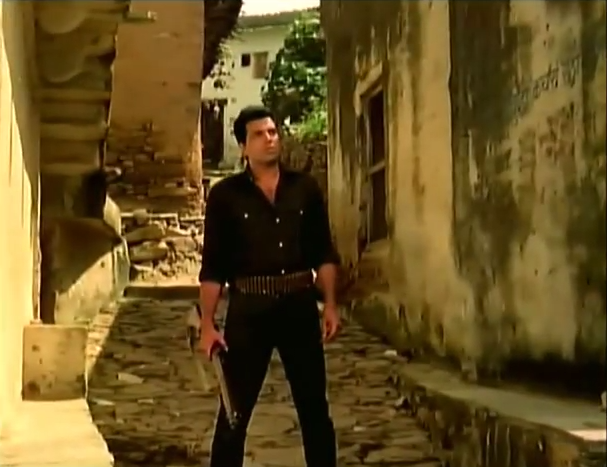 There's not many Hindi films that I've yet found that both look AND feel like a Hollywood or European Western. Because I have a fondness for the tropes of the genre and the aesthetics, I think I appreciate KD more than it deserves. 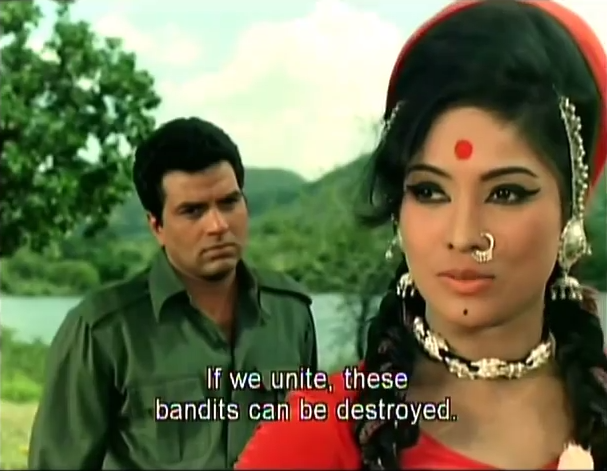 Also, I think the two leads have a hard time making up for the BORINGness of Moushumi Chatterjee and her feller in that film. It's realistic in the sense that she doesn't fall for the dacoits, but that doesn't help the interest factor in her story. By the end, you really only care about the two men "reconciling" or something to that effect, you know?